If you want only the most natural cradle cap treatment for your baby’s delicate scalp, Bella B, Bee Gone Cradle Cap Baby Shampoo could be just the thing. A sensitive skin friendly formula relying on gentle cleansing ingredients plus a combination of soothing natural active ingredients – including tea tree oil, oatmeal, shea butter, vitamin E and aloe vera. One thing’s for sure, Bella B’s Bee Gone Cradle Cap Baby Shampoo is free from harsh traditional anti-cradle cap/seb derm actives. However, can the all-natural counterparts live up to expectations? First, we investigate the company behind Bella B – are they reputable? Do they have the expertise needed to wave your baby’s cradle cap goodbye? Bella B is an American based, privately owned company. They manufacture body care for both mom and baby having everything from tummy butter to stretch mark cream and cradle cap shampoos. Established in 1999, Bella B is committed to making products which are – in their own words – natural, made with organic ingredients, light, clean and fresh. With this promise also comes a 100% no-go ingredient list. Use any Bella B product and you will find an ingredients list free from parabens, animal by-products, petrolatum, lanolin and harsh antifungal agents. To top it off, Bella B promises that all their products will be entirely affordable, making natural care of your baby’s scalp an easy and purse friendly decision to make. 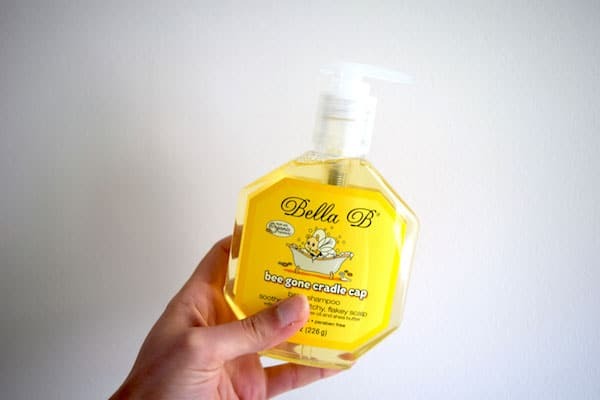 Bella B is a relatively young company with all-natural roots – but does their bee gone cradle cap baby shampoo reflect the same ethos? Arriving in a well-sized 8oz (226g) octagonal pump bottle, Bella B’s branding screams bath time fun. The bottle is quirky and the bumblebee on its front label will give you a giggle. Coming securely packaged with a cellophane seal overtop the pump, activation is easy. NOTE: be sure your pump head is screwed tightly onto the bottle before trying to twist open the pump head. The pump head springs upwards easily when its base is screwed on tightly, however, if not – you may struggle to activate it. Aside from the cutie branding, Bella B’s front label also tells us this cradle cap shampoo will soothe your baby’s itchy, flaky scalp with a hypoallergenic, paraben free formula. Sounds good to us. But will it still wash your baby’s scalp well? Taking an easy pump full of Bella B’s bee gone cradle cap baby shampoo the clear gel-like texture massages easily over a baby’s scalp. The lightly scented formula takes a little while to begin foaming, however, you should know foaming action doesn’t equal efficacy. Once Bella B’s cradle cap shampoo does foam, you’ll begin to see a flash of white with teeny tiny bubbles. 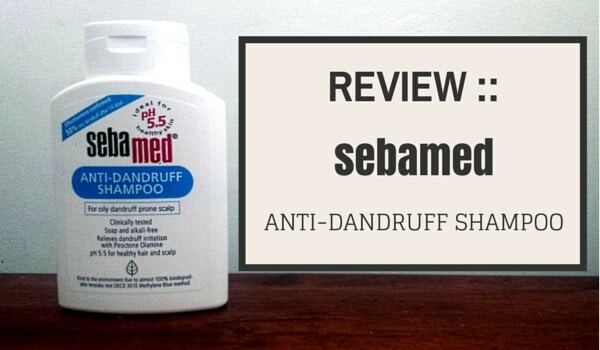 This makes massaging over your baby’s entire scalp simple and effective. Finally, the formula can be effortlessly rinsed away with lukewarm water. In use performance hits the mark, but what about the ingredients you’ll find in the formula, do they work? Will they as Bella B claim soothe your baby’s itchy, flaky scalp? The suspected cause of cradle cap is an overgrowth of normally present scalp yeasts which causes irritation and poor skin barrier health. As tea tree oil is a known antimicrobial and a known anti-inflammatory, it can be of great benefit to your baby’s scalp. Tea tree oil can relieve histamine-induced skin inflammation – histamine is a chemical your body and your baby’s body releases when it senses your health is being attacked – itch is its most common side effect. Tea tree oil has efficacy against many strains of the Malassezia yeast – this is the yeast thought to be responsible for your baby’s cradle cap. A very small amount of tea tree oil is all that’s need to show efficacy against certain yeasts known to cause upset skin. Oatmeal is another ingredient of note. Renowned for its great soothing effects, oatmeal is known to have natural anti-histamine type action in addition to pH balancing benefits. Oatmeal is also known to help skin re-establish a healthy skin barrier. Something cradle cap effected skin lacks. This 2002 published research study, tested the soothing, anti-inflammatory effects of oatmeal against skin which was purposefully irritated with a harsh cleanser known as sodium lauryl sulfate (SLS) – results showed oatmeal extracts have a significant counteracting effect. Published in 2015, this study showed colloidal oatmeal to have anti-oxidant and anti-inflammatory benefits which help treat the persistent itch associated with dry, irritated skin – perfect for your baby’s cradle cap affected scalp. Whereas this 2016 published study also showed oatmeal’s ability to help skin restructure itself to that of a healthy skin barrier while also offering pH buffering capacity. Skin pH is extremely important – troublesome skin often has a pH which is too high. We then have a soothing partner combination of shea butter, vitamin E and aloe vera with a whole list of similar benefits. Shea butter is known to help nourish and condition skin being an excellent, highly absorbable skin moisturizer with suspected anti-inflammatory benefits. Vitamin E is the most well tested and well known anti-oxidant, helpful for offering sensitive cradle cap scalps consistent protection. While aloe vera is an age-old remedy for dry, irritated, upset skin types. Overall Bella B, Bee Gone Cradle Cap Shampoo has a great collection of all natural ingredients. Now, what about the no list? 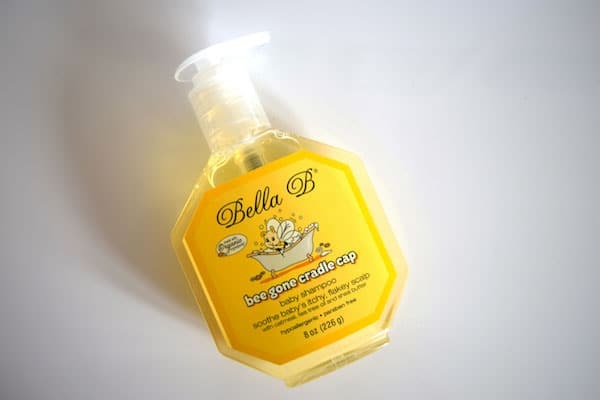 Are there any irritating ingredients to be found in Bella B, bee gone cradle cap shampoo? This is where Bella B’s formula really wins out, using a careful assortment of sensitive skin friendly cleansing ingredients plus a mild preservative system there’s only a couple of ingredients to watch out for. Disappointingly the company have added Fragrance to the shampoo. If you suspect your baby’s scalp is sensitive to fragrance, be sure to patch test this formula before use. In addition, a secondary cleanser called Cocamidopropyl Betaine is present. Now for the vast majority of us, this is a gentle effective cleanser. Unfortunately, it’s also a known contact allergen in some people. So much so, it has the dubious distinction of being named the Contact Allergen of the Year in 2004 by the American Contact Dermatitis Society. The company could have and really should have avoided adding both ingredients. 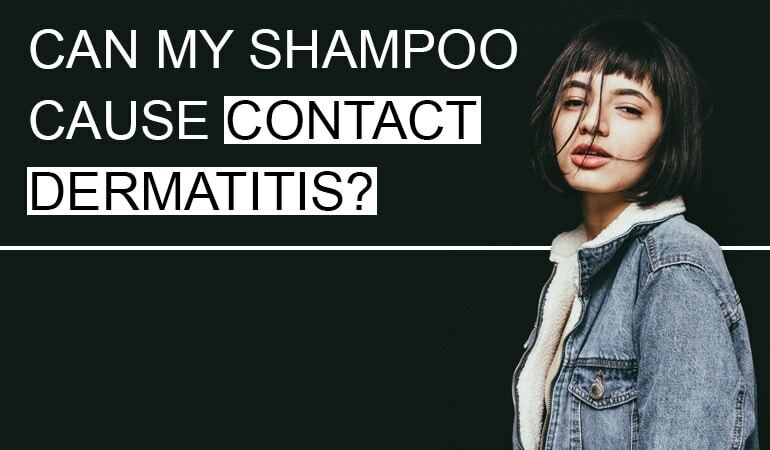 We’d be looking at shampoo nirvana with these two quite needless ingredients replaced. That said, while disappointed with these additions, we’re extremely impressed with this all-natural alternative for regular soothing of your baby’s cradle cap. 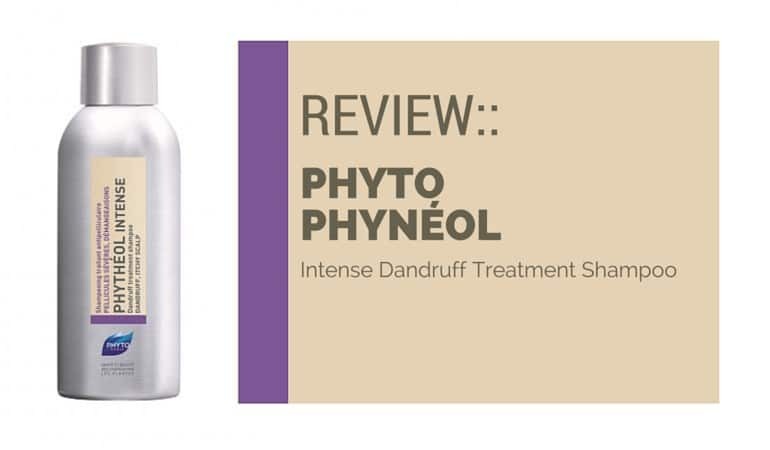 It washes well, the formulation shows imagination and care, and the actives added are a winner.